Tania (left) and Wai Quai during a recent visit to INTI International University. INTI’s American Degree Transfer Program (AUP) has provided alumni like Chong Wai Quai and Tania Lee the opportunity to experience a seamless transition to a choice of over 300 universities in North America, where they have the chance to experience the world in myriad ways, make their own discoveries and realise their true potential through an education that empowers learners. “I did not have any difficulty getting my credits from INTI transferred to my university in the US – unlike some of my friends from other institutions in Malaysia. In fact, at least 90% of my credits were successfully transferred so that I could take advanced courses right where I left off,” said Wai Quai, a Marketing graduate of St. Cloud State University in Minnesota, who was among the top 10% of students in the school of business. “What made me decide to join INTI’s AUP was the sheer number of American universities and colleges with links to INTI, which I could choose from to suit my academic needs and interests,” she added. For Tania, selecting the university to pursue her interest in nutritional science and dietetics was a matter of getting the right information through research and advice from the University Placement Services at INTI. Her studies at Iowa State University included an internship programme, which took her to Ghana where she participated in activities to alleviate hunger and malnutrition in rural areas. “As a student at INTI, where opportunities and resources for individual development are abundant, I was inspired to get out of my comfort zone, to explore and see the world for myself, and the momentum has continued in the US and right up to where I am now,” said Tania, who was Chairperson of INTI’s Life Saving and Swimming Club and an active member of the AUP Club. Both Wai Quai and Tania continue to lead active and productive lives. The former is a member of the Beta Gamma Sigma sorority and has travelled and worked in America and China. Tania, a swim instructor, was recently appointed as one of Malaysia’s two representatives at the International Olympic Academy in Olympia, Greece in June. 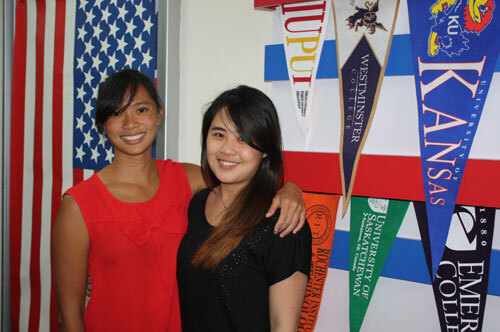 INTI’s Center of American Education (CAE) has seen many of its students gain admission to top universities in the United States and Canada. These include Ivy League universities such as Cornell University, University of Pennsylvania and Brown University where INTI students have successfully pursued studies in the Sciences, Social Science and Actuarial Science. INTI’s highly qualified and experienced staff and lecturers work tirelessly to ensure students benefit from international experience, innovative teaching methods and individualised grooming. Given INTI’s strong and long standing ties with US universities, coupled with its alumni’s impressive record of achievements, both on and off campus, many universities have accorded exclusive scholarships to INTI students. Academics from US universities also regularly visit INTI to present talks and share their knowledge and experiences with students. For further information on INTI’s American Degree Transfer Program, please call 06-798 2000 / 03-5623 2800 / 04-631 0138.